~ Please, NO $ solicitors - DALIA.com's Ph #s are on the â€œDo Not Callâ€� list & No blocked #â€™s can get through. Carefree, Cave Creek, North Scottsdale, North Phoenix, Arizona's local fine artist, Dalia.com was commissioned by national TPC, Tournament Players Club, for their new Champion Lodge in Scottsdale, AZ, a PGA TOUR Facility. This is known for famous golf celebrities & home of the Annual PGATOUR - Tournament Tour in Scottsdale, Arizona's ... Golf Open. In our local Sonoran Desert & surrounded by majestic McDowell Mountains. This Scottsdale, AZ Professional PGA Golf Open... (National & International Championship), has now become the Largest attended Golf event in the world. Dalia's grand scale designs ~ huge 2 story building & more ~ Murals hand painted for New Construction of Italian Tuscan motif, relief, custom mural, trompe l'oeil painting ~ entranceway signs in large commercial real estate retail & office condo malls. The owners of the new building construction commission Dalia to design all the walls in a cohesive manner to reflect the theme & image of the entire atmosphere. Dalia uses classical forced perspective & old master painting mural techniques to visually expand the space after her design is executed the entire building looks much larger to the naked eye. Dalia's commercial online portfolio shows extensive experience doing CREATIVE DIRECTION, Producing, Directing & DESIGN in various TV Commercials seen by sports & comedy enthusiasts [ NFL, NBA, ESPN, ESPN 2, NBC, HBO, Comedy Central, etc...] ~ also web director, website development with a Cohesive Structure & Content Design, Graphics, Animations, website interface design, account executive, production management, etc...! Client handholding, consulting & site management, contracts, also Public Relations & Marketing Advertising Design. The School of Visual Arts [SVA] with a Bachelor of Fine Arts [BFA] degree. Â With 20 years of experience ~ she is continuously thinking outside the box ~ innovating & never imitating. Dalia's paintings expands & enhances the quality of your environments. 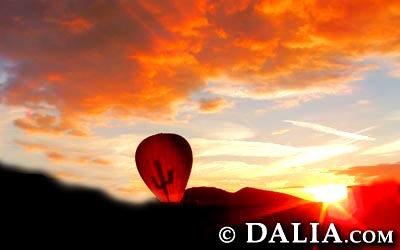 Dalia uses digital photos ~ to scale realistic renderings for your approval before painting on your walls so you can see exactly what your walls will look like before she touches one stroke of paint on your walls or canvases & full color photos of before & after compositions right on your flat bid contract. Dalia works confidentially & exclusively with clients on commissioned artwork. She only Confidentially shows her Fine Art to Private Collectors & Personal Portfolio Viewings. About the huge scale murals Dalia did at the Restaurants in Cave Creek & Carefree, AZ & exterior paintings on all the walls of the entire Italian restaurant building in Peoria, AZ. " Quoted from AZ Republic Newspaper ~ Scottsdale News Section: "Restaurants in Cave Creek Carefree commissioned Dalia for their interior Murals"
Dalia's artwork & paintings were written up in the prestigious area of Hamptons Beach Estate area in Hamptons Magazine & The Hamptons Cronical about her commissioned fine art paintings when she was represented in galleries in Quogue, South Hampton, & Montague New York, & Galleries in SOHO, New York City.